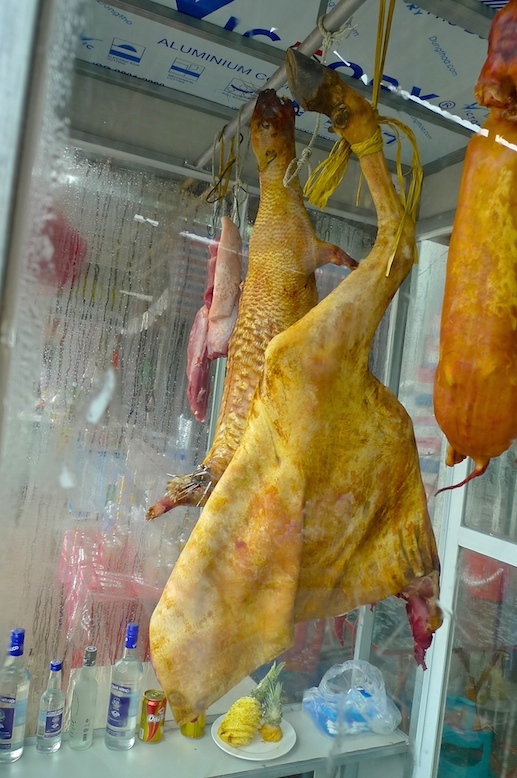 WARNING : This post contains disturbing images of animal carcasses hung on hooks. Please proceed with caution if you do not wish to see them. I have placed the images towards the end of the post with a warning sign beforehand so that you can skip them if you wish. 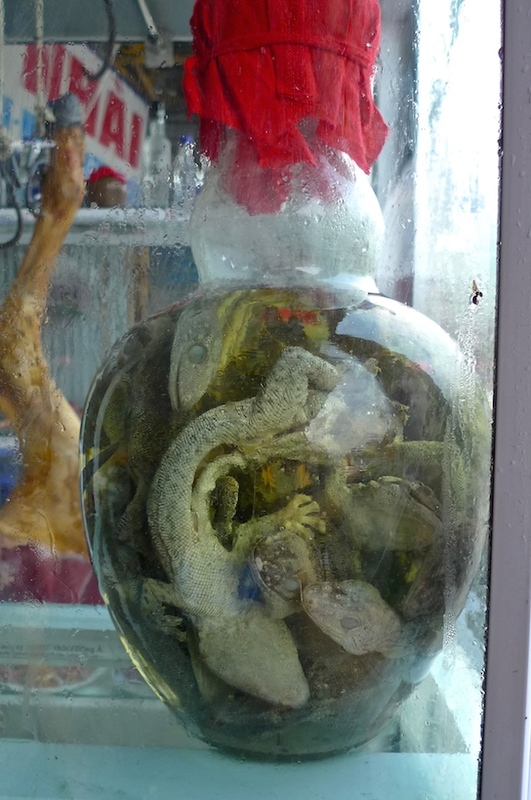 On my fourth day in Hanoi, my friend and I went for a day trip to Perfume Pagoda (Chua Huong). We had booked this trip via Sinh Cafe Travel a few days earlier. The price for the one day trip was US$25 per person which include lunch, entrance fees, transport and a tour guide. The young tour guide by the name of Nam Nam (I remember his name because it rhymes with Vietnam!) came to pick us up at our hotel at around 8.30am. We were the last few to be picked up that rainy morning so we ended up sitting at the back of the bus. If you look at the photo above, you can see that they have cleverly maximised the space in the bus as the seats can be expanded in the standing area between the left and right rows. Well, this is still better than the buses in Guilin, China where they actually provide you with stools to sit in the standing area! The journey by bus (which was heading southwest of Hanoi) took roughly three hours, including an unnecessary stop (read time waster) at a souvenir shop as usual. It could have been faster had the road not been so bumpy. It was especially bumpy during the last half hour of the bus journey. We even passed by a very huge pothole filled with rain water! Luckily we survived the pothole and reached the riverside of Duc Village. From here, we entered the second phase of the journey to Perfume Pagoda. Yes, if you must know, there are no roads to Perfume Pagoda. You need to take a bus, then a boat and finally hike up the mountain to reach it. That is exactly how the Vietnamese pilgrims reach this important religious site every year after Tet (Vietnamese New Year). Oh, but don't be put off with that hiking part - we are living in modern times even in Vietnam, so now they have cable cars to take you up, so don't worry haha! Although that sort of defeats the purpose of the pilgrimage right? OK, maybe the pilgrims should hike and we tourists take the cable car. LOL! I was actually looking forward to this boat ride! There were rows and rows of metal-bottomed boats along the Yen River. Each boat is rowed by two local oarswomen. We asked Nam Nam how much we should tip the oarswomen and he said US$1 would be sufficient. Unfortunately, that was not what one of the women who rowed our boat expected from us. We had a pretty unpleasant experience with her. These were the two women who rowed our boat. The one at the back of the boat showed us a sour face when most of us paid her US$1. She kept insisting for more and was not happy when some of us paid her in Vietnamese Dong. I mean, come on, it's just so rude to ask for more tips - it's our right to decide how much to give! The one in grey shirt was rowing at the front. She was OK. But this woman rowing at the back of the boat had a really bad attitude! She was smiling during most of the journey (although she wasn't in this photo) but turned sour face at the end when she saw how much we were paying her. Sorry I have to single her out and even show her face here, but I was totally pissed off. I knew her rowing job was tough - I have to admit it is hard work rowing for more than an hour. Total that up close to 3 hours since she needs to row us to Perfume Pagoda and back. Knowing how tough it was, I did not pay her US$1 like many others. I paid her US$10. And she still showed me a sour face!! What the hell. I wish I could have taken my 10 bucks back! Our boat passed by this man sleeping in his sampan. Just got to snap a picture! Nam Nam, our tour guide - the one right in front of the lady rower and looking left. A lot of people (especially tour agencies) had told me it would be a very scenic boat ride with views of stunning limestone karst formations and mesmerising rice paddy landscape. In fact, the boat ride was my main reason to go on this trip to Perfume Pagoda. Never trust what the tour agencies tell you. Because as it turned out, I was not really impressed. Maybe because I have seen it all before in Guilin, China. Or maybe Guilin has nicer scenery - I am not quite sure. But the boat ride was still pretty fun. So I was not really complaining. Just that I was not impressed. It just did not make me go "Wow!" Nam Nam explaining some of the things we saw during the boat ride. That poor lady rower looked pretty exhausted, so Nam Nam helped her with the rowing. I was seated almost at the back of the boat on a higher seat, so I did not need to stand up like this lady to take pictures. After a while, everything around us just looked the same. It was starting to get a little boring when we saw we have reached our destination! No, not Perfume Pagoda - we still need to climb up the mountain, remember? This is the base of Huong Tich Mountain and we disembarked there. Everyone had left the boat except the sour faced rower. Sorry just can't stop myself from calling her that although she was not showing any sour face at that time. Took a shot of the scenery from the jetty. WARNING : Disturbing images ALERT right after this picture below! Please skip the rest of the post if you do not wish to see the images. Before going up the mountain, Nam Nam told us that we would be having our lunch first at one of the restaurants there. We passed by a long row of restaurants and eateries and I was wondering which restaurant we would be going to. 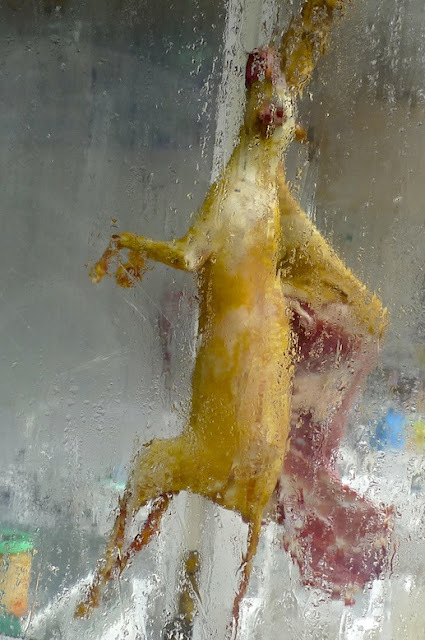 What animal was that?! Not a dog, I hope. 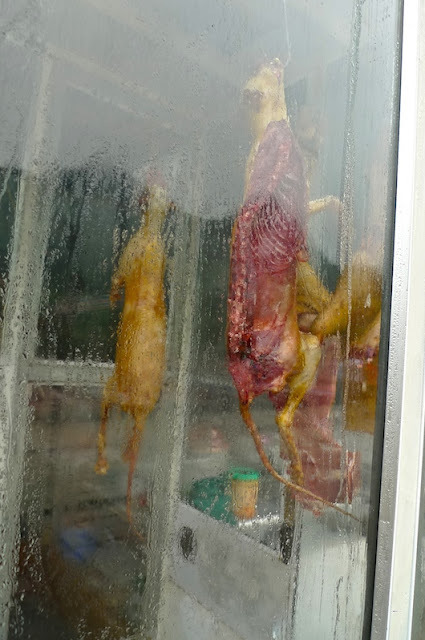 These carcasses were hung off hooks and displayed in front of almost every shops there. 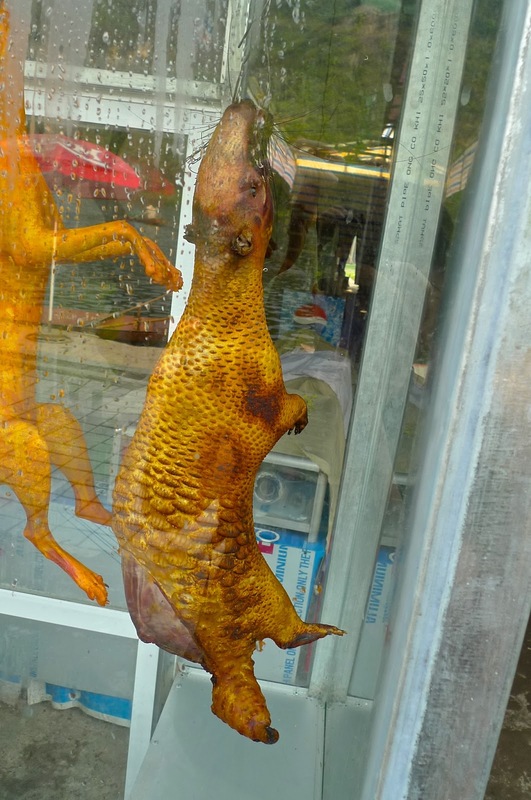 Although I have heard that people in Vietnam do eat these animals, it's simply not the same as seeing the carcasses hanging like that. Having said that, I was not particularly disturbed with what I saw. 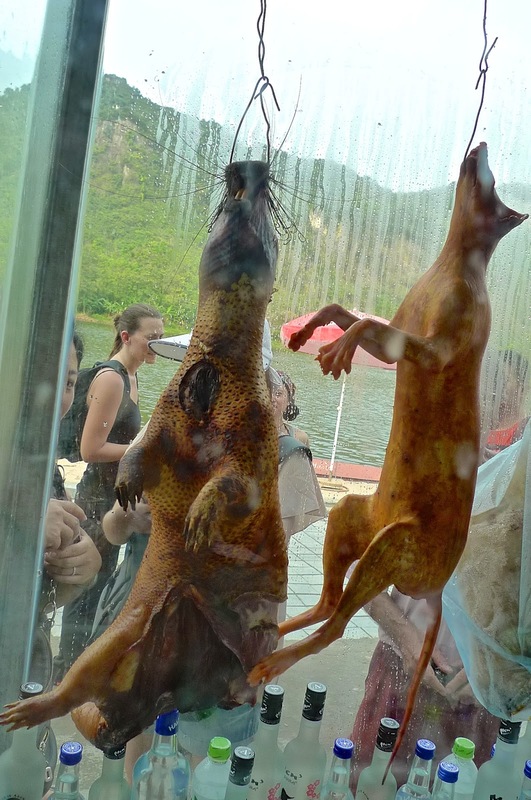 But it would surely be a shock to animal lovers and tourists not accustomed to seeing such garish display of dead animals! 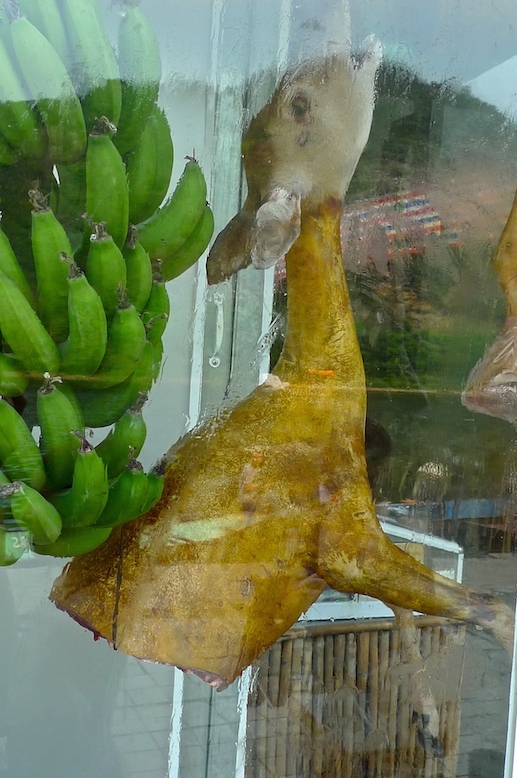 That's a deer hanging together with a bunch of bananas. Oh no! 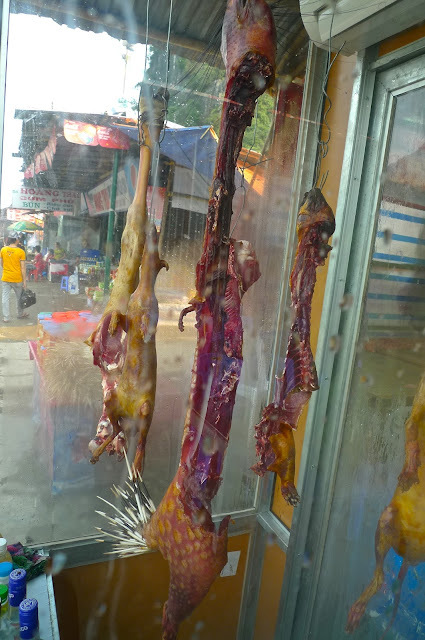 I would surely lose my appetite after seeing all these! I hoped we were not going into one of these restaurants! How could we even stand the smell? Then we stumbled onto these bread. What's with those "legs"? Maybe I should have bought one of these bread to try but after seeing all those carcasses, I just did not feel like having any! So what did we eat for lunch? And did Perfume Pagoda live up to my expectation?